Vera Carrell Griffin began painting in the early 1960's. She first started painting on her own and then began taking art courses. Well-known artists she studied with were Dr. Emilio Caballero, former head of the art department at West Texas A and M in Canyon, Texas, Paul Milosevich, Mac Carrow and Ben Konis. 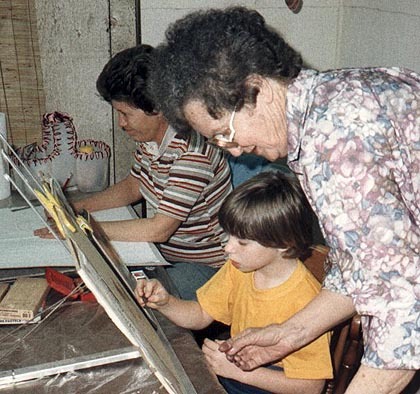 For more than 15 years she conducted weekly art lessons for adults and children in the area where she lived, as well as workshops throughout the South Plains and Permian Basin areas of Texas. Her work consists of landscapes in oils, some western art, and portraits in pastels and charcoal. She entered various shows and exhibits and won numerous awards for her work. Her paintings have been displayed in banks and restaurants in her local area, and in a gallery at Town East Mall in Mesquite, Texas. Here are a few of her paintings that are owned by the family. These are not for sale, but prints are now available. They are put here for your enjoyment. Feel free to use them as wallpaper on your computer. There are many other paintings held by other family members. Read Reminiscings the Autobiography of Vera Griffin. in which she tells about growing up in a pioneer family. Wow, I really enjoyed reading this. Found it completely by accident. The song "In All Our Dreams"
was written by Vera's grandson, Elton. View the lyrics for this song here.